What is Geothermal / Geoexchange? Geoexchange is often called a Geothermal Heat Pump system. You'll also hear the terms Geothermal Ground Loop, Ground Source Heating, and Geothermal Heating. At its most basic level, it provides a way to use the constant temperature of the ground to heat or cool your house in an efficient and environmentally-friendly manner. About four feet down (below the frostline) the ground stays at a fairly constant temperature year-round. Deeper still, there is little variation in the temperature. For our location in a suburb of Washington, DC, it's about 55 degrees Fahrenheit. Geoexchange systems run a long tube filled with water and some form of antifreeze underground. A pump system moves the water through the geothermal loop and passes it through the heat pump in the house. In the summer the loop enters the house and the 55-degree water absorbs the heat. The water, now warmer, goes outside back into the ground and cools to 55 degrees. So your house is cooler and the ground is warmer. You just moved the heat somewhere else. In the winter it's a bit more complicated. The 55-degree water comes into the house through the loop. But most people would rather not live in a 55-degree home. So they have a machine called a heat pump, which "squeezes" the heat out of the water in the loop. The house is now warmer. The water, now about ten degrees colder, leaves the house and heads back into the ground. Now underground, the water warms back up to 55 degrees and is eventually cycled back into the house. Just like an ordinary cooling/heating system, fans circulate the cold or hot air through the existing ducts in your house. 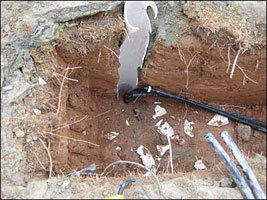 Once the geoexchange system is installed, everything works without you having to think about it any more. What Convinced Us to Go with a Geothermal Heat Pump System? Our furnace was over twenty years old (and the air conditioner was also on its last legs) and needed costly repairs every year or so—over $1,000 in the past several years. Since we were going to have to spend a good bit of money for a replacement, we started researching our options. Geoexchange offered much lower monthly bills for heating and cooling while being the most environmentally-friendly option. So we came up with a list of pros and cons. Save between 30 - 70% on heating and cooling. Geoexchange is about twice as expensive to install as a traditional heating and cooling systems. Unit is expected to last about twice as long as traditional unit (heat pumps tend to last longer; well tubing is guaranteed for 50 years) Initial cash outlay somewhat of a challenge. Environmentally-friendly (carbon-neutral if electricity is bought from renewable resources) Installation is more disruptive due to drilling. Adds to resale value of home. Once the initial installation is done, nothing is visible outside (even our old AC unit is gone). In the end, geothermal /geoexchange seemed like a better financial and environmental investment. I also have to admit that, being a science teacher, the science and technology (not to mention the idea of drilling down 300 feet in my yard) had a certain attraction for me. The environmental side appealed strongly to both Sheila and me.